Printing at the library just got easier! Washington County Cooperative Library Services is now offering a new cloud-based printing service that makes printing on-the-go convenient. With Print from Anywhere, you can print to a library printer from your laptop in the library, your computer from home, or your mobile device from almost anywhere. With Print from Anywhere, you have three options for printing: web form, email, or mobile app. Once you successfully submit a document, it waits in a private queue at your library for at least four hours. At the library, release your print job by entering your email address and paying for the pages you print. 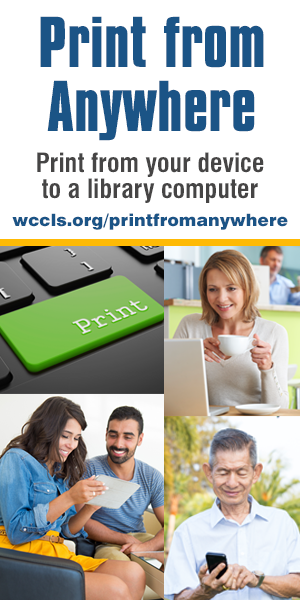 Print from Anywhere is currently available at many WCCLS libraries, and is expected to be at most locations within the next few months.